This property is directly associated with the initial period (1902-1920) of downtown commercial expansion that occurred due to local economic prosperity after the Klondike Gold Rush and in tandem with explosive population growth and suburban residential development. During this era, modern urban architectural scale began with the construction of the earliest steel-frame highrise buildings and the establishment of a concentration of banking enterprises and department stores along Second Avenue from Cherry Street to Pike Street. The initial regrading of Denny Hill and the commercial redevelopment of the former University Grounds (University/Metropolitan Tract) were major factors that facilitated northward and eastward commercial expansion. 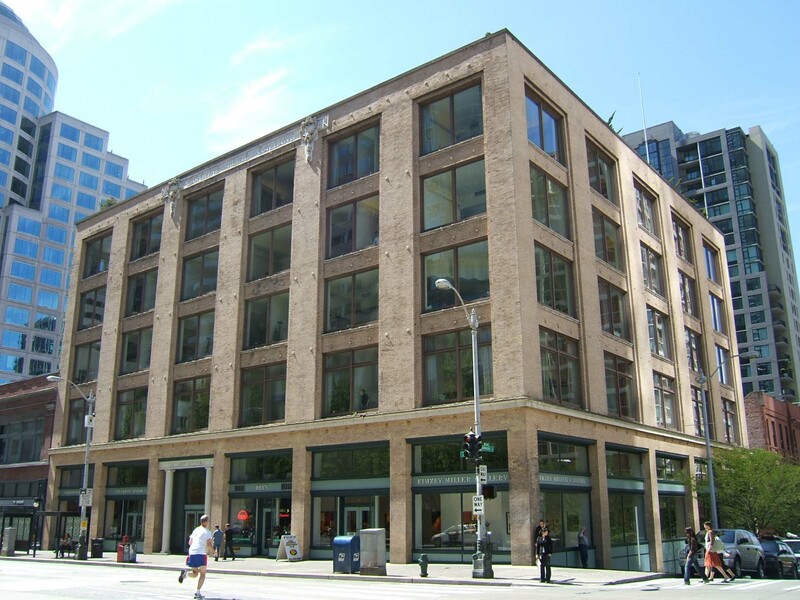 In 1914, the owners of the Frederick and Nelson Department Store purchased property with the intention of building a large, five-story store at Fifth Avenue and Pine Street, thus solidifying the location of the future downtown retail core. A significant number of extant commercial properties dating from this era remain within the downtown commercial core, including: numerous hotels, banks, business blocks and early highrise commercial buildings, as well as clubhouses, apartment houses and theaters. However, few specialty and department store building from this era remain intact and well preserved. Buildings specifically designed to be devoted to specialty retail or department store use typically included lower floor level commercial display spaces and upper floor level loft, sales and/or storage areas. The larger department store buildings were typically masonry construction and three to five stories in height, exhibited either a two or three-part commercial block facade composition, and were further dignified by prominent cornices and storefront canopies. This building type did not require as much natural light and ventilation as neighboring business blocks; thus, lot coverage and building mass could be maximized. Specialty retail and department stores typically required more elaborate interior finishes and fittings, as well as more elaborate exterior construction with large display windows in order to exhibit merchandise and often with ornate canopies providing pedestrian protection. As the retail district expanded along First Avenue and uphill along Second Avenue, a fairly wide range of store buildings were designed and constructed according to specific use, lot size and location. By 1910, a distinct concentration of specialty and department stores were located along Second Avenue from Marion Street to Pike Street. The Rialto Building (1894, destroyed) at Second Avenue and Madison, housed the Frederick and Nelson Department Store, which was one of several major retail enterprises that made Second Avenue a fashionable shopping district, including the Bon Marche Store (1896, 1902, 1911, destroyed) at the SW corner of Second Avenue and Pike Street. The street included at least five other major buildings, including: the Arcade Building/Rhodes Store (1903, destroyed), the subject Galland Building/Stone Fisher Lane Store (1906); the Chapin Building/ McDougall and Southwick Co. (1907, destroyed); and J.A Baillargeon Store (1908); all housing specialty and department stores with expansive street frontage and located at prominent street intersections. In late 1905 two large five-story department store buildings were under construction for the Stone, Fisher & Lane Department Store chain, one in downtown Tacoma and the subject building. Stone, Fisher & Lane started in 1891 in a small store building in Tacoma. By 1896, they had opened a branch store in Everett and by 1900 they operated a store in Seattle, in the nearby Brown Building (1898). In 1903, the chain expanded to Olympia and by 1905 they had established a store in Bellingham, the largest department store outside of Seattle. They also operated a wholesale warehouse in Tacoma. The company was headed by George H. Stone, president; W.J. Fisher, vice president; F.C. Walker, second vice president; and Charles G. Morse, secretary. Their Seattle store building was leased from Caroline Kline Galland (and subsequently from her estate) for an unknown period of time. The store building was financed and constructed for Caroline Rosenberg Kline Galland, a noted Jewish philanthropist. A native of Bavaria, Caroline Rosenberg was first married to Louis Kline, owner of a Seattle clothing firm. He died in 1892, and she soon married Bonham Galland, a retired San Francisco merchant. In 1903, she commissioned architect Max Umbrecht to design her home and Umbrecht subsequently designed this department store building. At the time of her death in 1907, Kline Gallard was one of Seattle's wealthiest women, primarily due to her real estate holdings in the burgeoning commercial district, including the subject building. She left her estate that was valued at $1.5 million to numerous charities, including the Caroline Kline Galland Home for the Aged and Feeble Poor, which continues to operate in the Seward Park neighborhood. By 1937, the building primarily housed the Ryan Furniture Company and two small retail shops. The building appears to have been owned by the estate of Caroline Kline Galland until 1969, when it was purchased for $500,000 by the Samis Land Company. In 1985, the building was leased from Sam Israel (Samis Land Company) by Wright Runstad Company and refurbished in conjunction with the construction of the Washington Mutual Tower on the opposite side of Second Avenue. Max Umbrecht was born in Syracuse, New York in 1872 and trained as an architectural apprentice in New York City. Umbrecht migrated to Seattle about 1900 in order to work for the W/L. Smith family. He is credited with several commercial buildings as well as the design of private residences including the John W. Clise Residence, at Willowmoor Farm (now Marymoor Park) in Redmond and built in 1904. From 1908 to 1911 he was in partnership with A. Walter Spalding. He returned to Syracuse in 1922 and died in 1955. This is a partially intact and rare example of a particularly important downtown property type - department store building - from this era. Furthermore, it is associated with both a person of significance, Caroline Rosenberg Kline Galland and a notable local architect, Max Umbrecht. Located at the sloping SW corner of Second Avenue and University Street, this five-story building historically housed a department store enterprise, then specialty stores with the upper floor levels used as warehouse or loft space. The ground floor currently houses several retail stores and the upper floors are used for commercial office purposes. It measures 108’ x 120’ with six bays oriented toward Second Avenue and five bays toward University Street. The two-part commercial block façade exhibits some distinctive architectural character but has been altered to a significant degree. The steel and concrete structural system (with a concrete sub-basement/basement/ foundation) is clad with yellow-color brick laid with fine, narrow mortar joints at the base and the shaft. The storefront/base level is accentuated by a terra cotta intermediate cornice. Recessed window bays extend from the 2nd through the 5th floor levels and accentuate the east and north elevations. Large windows with narrow recessed spandrels further distinguish the shaft. The current Chicago type windows match the original windows in form/configuration and appear to be original or an in-kind replacement product. The only ornament on the facade is a wide terra cotta plaque at the cap above the central two window bays, which states “Caroline Kline Galland” that is flanked by terra cotta cartouche ornament. The roofline is terminated by a simple coping member. The original ornate metal cornice that included an open balustrade and parapet wall has been removed. A modern penthouse addition and pergola have been added at the roof level. Alterations have been made to all of the storefront bays although the mezzanine level windows appear to match historic images. All of the storefronts have been reconstructed with modern display windows and bulkhead configuration and a modern two-story glass and steel entry vestibule has been added. There do not appear to be any intact or architecturally significant interior building features, finishes or public spaces.